with the provisional lead. Three games were played on June 4. Ko Iso 8P (W) beat Kono Rin 9P by resig. ; Cho U 9P (W) beat Kanazawa Makoto 7P by 2.5 points; and So Yokoku 8P (W) beat Takao Shinji by resignation. That left three players on two losses: Ko (5-2), Kono (4-2), and Takao (4-2). Kono has the advantage of being the top-ranked player in the league, but Ko has the advantage of having won an extra game. He gets a bye in the next round, then plays Takao in the final round. Incidentally, the above-mentioned loss cost Kanazawa his place in the league. Tokyo perspective on the LG Cup: The E-Journal has already featured a report on the 20th LG Cup, held on June 8 and 10. Here is how the opening rounds looked from Tokyo. The big surprise was that the most junior Japanese representative, Yo Seiki 7P (actually, a Taiwanese member of the Kansai Ki-in), had the best results. 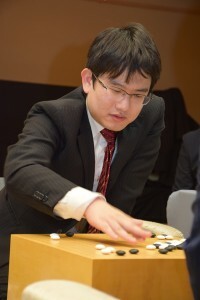 While the other players were eliminated in the first round, Yo, who was making his debut in a full-scale international tournament, won his way through to the quarterfinals. He joins four players from Korea and three from China. In the first round, Yo (W) beat Peng Liyao 5P of China by resignation. 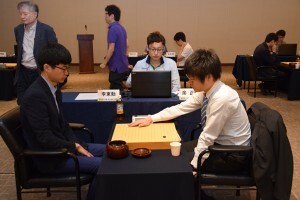 In the second round (left), he bested Lee Donghun 5P of Korea; again Yo had white. The latter win gave him revenge for his loss to Lee in the Globis Cup. Two years ago, Iyama Yuta and Takao Shinji also made the best eight but were then eliminated. The challenge for Yo will be to go further. He could become a new hero for Japan. The quarterfinals are scheduled for November 16.